Part I　Report concerning "Research on Domestic Law for Implementing Convention on the Rights of Persons with Disabilities"
This report is a record of the “Korea Japan Disability Studies Forum 2012”, and event held on November 23, 2012 in Seoul, Korea. Korea Japan Disability Studies Forum is an international research exchange program organized since 2010 by Association for Research on Disability Studies (a research group under the umbrella of the DPI (Disabled Peoples' International) Korea) and the Research Center for Ars Vivendi. 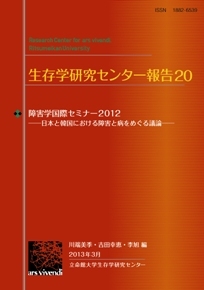 The first forum was held in 2010 in Soul, the second one at Ritsumeikan University, Kyoto in 2011, and the third one in 2012 ? again in Soul. The initiative enjoyed participation of mainly researchers interested in disability studies and people with disabilities from the two countries. This report is composed of three parts. Part I contains the lecture of Dr. Osamu Nagase (Visiting Professor of the Research Center for Ars Vivendi, Kinugasa Research Organization, Ritsumeikan University), and the lecture of Mr. Seok-Gu Lee (Secretary General, Korean Foundation of People with Disabilities). Part II carries research papers by Yuri Goto (Post-doctoral Research Fellow of the Japan Society for the Promotion of Science), Katsunori Watanabe (Post-doctoral Research Fellow of the Research Center for Ars Vivendi, Kinugasa Research Organization, Ritsumeikan University), Mayuko Ono (Post-doctoral Research Fellow of the Japan Society for the Promotion of Science), Samo Yoon (Policy Committee Member, South Korean Forum for Human Rights of People with Disabilities), and Dr. Kyung Mee Kim (Associate Professor, School of Social Welfare, Soongsil University). Lastly, Part III contains a number of papers submitted for poster presentations on the day. Research Center for Ars Vivendi, Ritsumeikan University was established with recognition of its Global COE Program Ars Vivendi in 2007 and, as mentioned above, has been continuing a research exchange program with the Association for Research on Disability Studies. The "mastermind" behind this initiative is Hee Kyong Chong (graduate of the Graduate School of Core Ethics and Frontier Sciences, Ritsumeikan University, visiting researcher at the Research Center for Ars Vivendi, part-time lecturer at the Kyonggi University, Director of the Korea ALS Association). For a long time she has been closely involved with the movement of people with disabilities in Korea and has taken a doctor's degree at the Graduate School of Core Ethics and Frontier Sciences, Ritsumeikan University. 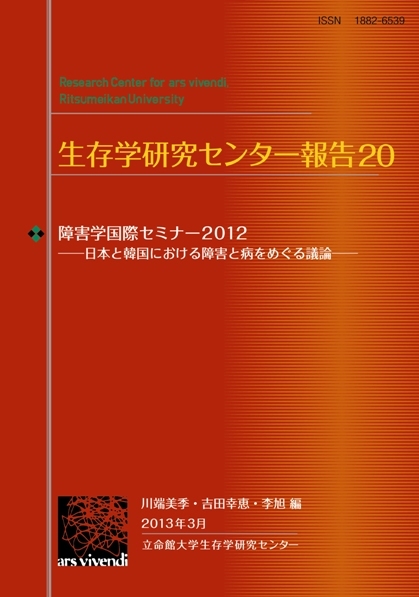 She has also translated into Korean Ars Vivendi: Sociology of Disabled People Who Have Left Home or Institutions (1995= 2012) by Shin’ya Tateiwa, professor at the Graduate School of Core Ethics and Frontier Sciences, Ritsumeikan University and it was she who introduced and popularized achievements of Japanese disability studies in Korea. Without her, this international academic exchange most probably would not have been possible. This time, after the initiative celebrated its third year, the Research Center for Ars Vivendi decided for the first time to publish a center report of the achievements. An academic exchange event allowing people of different languages and cultures to learn from each other is surely a joyful occasion, but planning and holding it requires a lot of time and tremendous effort. And it is only thanks to the relentless efforts of graduate students from South Korea that we have managed to hold the event every year. I participated in all of the series of academic exchange events since the first one held in November 2010, and I simply cannot find words to express how grateful I was each time for the hospitality of the Korean side. When I first met the members of the Association for Research on Disability Studies, I was truly amazed by their outstanding ability to take action and also ? perhaps even more so ? by their astonishing drinking capabilities. In Korea, movement by people with disabilities is first and foremost intense. Very often one may see people with disabilities staging sit-down demonstrations in front of the Korea National Assembly Building or some other public government offices. In Japan, one organization well known for its intense movement is Aoi Shiba no Kai, an association of people with Cerebral Palsy, which in 1977 organized a movement protesting against bus companies' refusal to take disabled passengers. Movement by people with disabilities in Korea became particularly active in the 1980s, when, influenced by a larger social movement and the student movement, which were at their peak then, became increasingly stronger in terms of both theory and organization. DPI Korea was founded in 1986, in the midst of this turmoil. People with disabilities went on long hunger strikes to “improve” train stations, “improve” the laws. Many Koreans with disabilities engaged in such movements from around 1990 (for details of Korean movement of people with disabilities from the 1980s onward refer to a paper by Samo Yoon in Part II of this center report). Most of the disabled who participated in these movements now say: "Today the movement of the disabled in Korea is stagnant. We would sure like to learn from the disability movement in Japan, and follow your example…"
Today in Korea both the movement by people with disabilities and the research in the area of disability studies are on the upswing, with both activists and researchers greedily pursuing new knowledge and ideas. What is this discipline of disability studies in the first place? To this question, there is no definite answer. How about this one: on what condition do people with disability/illness have the right to live? To this question there is an answer, and I believe it to be the answer given by Shin’ya Tateiwa in his book, and the answer is that there is simply no such thing. Each and every one of us, as soon as we are born, has the right to live, and live freely. However, if one cannot move his hands or legs, cannot see or hear, he/she has difficulty living. What has to be done about it then? I believe that for each and every one of us who "can't", there should be someone else who “can” ? and does ? whatever is needed. If this happens, this surely will instantly make our lives much easier. People with disabilities, who can raise their voices, are making a statement as loudly as they can, saying: "For such and such reasons, it is hard for us to live. Make our lives easier by helping us, doing for us things we cannot do ourselves". This is really, truly that simple. What we have tried to do in this booklet is to create a text spun out of the actual heart-felt narratives of those, who are trying to make this statement and of those who are supporting them (or going to do so in the future). The main theme of this time's seminar was "Research of Japanese Legislation for Enforcement of the Convention on the Rights of Persons with Disabilities", but as researchers participating in the seminar came from a wide range of backgrounds ? not only disability studies, but also sociology, social welfare studies, historical science, etc. ? the discussion went much further. But whether the papers collected here are unsorted odds and sods or, rather, a diverse but coherent picture is for the reader to decide. My most sincere hope is that the texts collected here will make their reader interested in the activities and ideas of the discipline of disability studies ? not only the research conducted in Japan and South Korea but everywhere across the world. As I live in Japan and am engaged in research on South Korea, it greatly worried me when by a curious coincidence in the end of 2012 there was a major change in the political situation both in Japan and in South Korea. I will be closely watching how the relations between Japan and South Korea and the welfare of both countries will change in the future and hope that the still remaining numerous problems between the two countries will be resolved. And on this note I would like to end this preface, expressing my heartfelt gratitude to all those who participated in the event.